With over 2 million CompTIA-certified IT professionals worldwide, CompTIA is the clear leader in IT certifications. And with certifications covering IT security, networking, cloud technologies, and more, CompTIA certifications can boost your skills and credentials no matter where you are in your career. Get the most out of your certification pathway with CompTIA Stackable Certifications. Our CompTIA Stackable Certification Bundles are your end-to-end solution for preparing for and passing the CompTIA exams associated with your learning path. 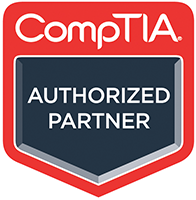 As a CompTIA authorized training partner, Learning Tree can help you get the certified CompTIA training you need to prepare for your CompTIA A+, Network+, Security+, CASP, or CySA+ certification exam. We also offer a comprehensive range of training, so you can earn CompTIA Continuing Education Units (CEUs) to maintain your certification. The facilities and staff were excellent. The instructor was well-versed in the subject matter, and I feel much better prepared to take the certification exam.